“Undecided Blues” was written in 1941 by blues shouter Jimmy Rushing (also known as Five-by-Five, due to his stature). Rushing was born in Oklahoma City into to a musical family; his father was trumpet player and his mother a singer. He started his career as an itinerant blues singer in the early 1920s. He sang with Jelly Roll Morton and other early jazz orchestras before joining the Bennie Moten band in 1929. When Moten died in 1935, he joined the Count Basie Orchestra, which was his home for many years. 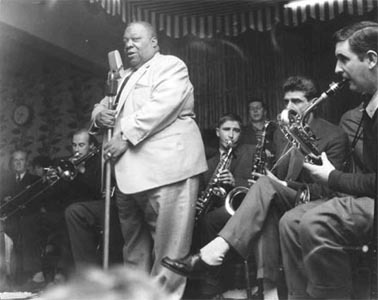 Rushing with the Count Basie Orchestra first recorded “Undecided Blues” in 1941. Jimmy Rushing died from leukemia in 1972. “Undecided Blues” was recorded in May, 2001 and released that same year on Playin’ With My Friends: Bennett Sings The Blues. The vocals were arranged by Rob Mathes.